Summer or winter, a good drink always deserves some nice ice. Nowadays, it comes in all shapes and sizes that the typical cubes are becoming so 90’s. More than an ingredient to the perfect drink, ice also happens to be helpful for health matters. It’s a pain reliever and could reduce a swelling. It can also be used to lower a fever. Having some ice at home always come in handy. To make some, you use the freezer. However, it can’t always keep up with the needs and the ice might have a quaint smell of fish. That’s why an ice maker is better. To help you pick your ice maker, we made a breakdown for you. Tired of running out of ice in the middle of a party? The ice maker is the answer to your problem! Designed to provide you with a large amount of ice over the span of minutes, the device is nonetheless small. It fits subtly with your home décor. Whether it’s for a personal or professional use, hundreds of models are available on the market. Here are the top 5 ice machines, known for their great values. Measuring only 9.5” x 12.9” x 14”, the hOmeLabs portable ice machine finds its place easily on your bars or countertops. It produces two choices of chewable bullet shaped ice – small for bottles and medium for other drinks. The ice generator can make 26 lbs of it per day. In other words, it delivers up to 1.5 lbs of ice at a time. 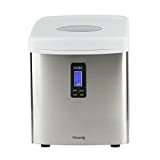 Despite its high capacity, the hOmeLabs portable ice maker is quiet and requires only 120 watts of energy to function. The ice generator shuts off automatically when the ice basket is full or when the tank needs to be refilled. You can also serve the ice right away because the ice tray is removable, and the machine comes along with a scoop. Like the hOmeLabs Portable Ice Maker, the Aicok one has also got a thoughtful design. It recycles the water to generate more and more ice in two simple steps. Select the ice cube size then press the “ON/OFF” button. This ice machine takes 6 to 14 minutes to make 9 ice cubes. With a capacity of 1.1 lbs per hour, the Aicok Portable Ice Maker produces less than the hOmeLabs one. That is because its water reservoir is smaller, and the motor isn’t as powerful – 105 watts. That makes it nonetheless a very silent device. Also, thanks to an embedded infrared technology, it prevents ice from overflowing with warning lights, also stops automatically, and starts likewise when the problem is solved. A very safe device indeed! The Vremi Countertop Ice Maker is the good things come in small package. Despite being made of stainless stell, this device is small, light and powerful. Running at 120 watts, it creates 9 chewable bullet shaped ice cubes within 8 to 10 minutes – each cube weighing 8 grams. The Vremi Ice Maker doesn’t use much water for the process as it recycles molten ice. This 9.5 x 12 x 13.5-inch machine doesn’t need a water hookup. It is therefore perfect for outdoor parties like a barbecue or for camping because you can bring it anywhere. Indoors, it has it place on bars, kitchen counters and tabletops. It is a very quiet machine, so it won’t disturb you nor customer. This ice generator comes with a removable ice bucket and a plastic scoop, making the ice ready to serve! Like the previous ice makers, the Frigidaire EFIC101-WHITE EFIC118-KL can provide you with 26 lbs of ice every 24 hours. The white ice machine is as powerful as the one we’ve seen so far but it’s lighter despite being bigger (13 x 9 x 13 inches). Up to 9 ice cubes are ready within 6-7 minutes. It also offers a choice of sizes – small and large. The only issue with the Frigidaire EFIC101-WHITE EFIC118-KL is that it makes more noise compared to the other devices. With 42dB, it could be as loud as a fridge. Hence with name, by the way. The Kealive Portable Ice Maker highly to get ice for smoothies and drinks, for food, for coolers and for emergency. It allows you to choose between small and large bullet shaped ice. The ice generator delivers the same amount as the previous ones with a 1.8 litre water tank: 26 lbs per day. Equipped with a filling water pipe, you can connect a tap to load the tank. You can still fill the reservoir directly. What makes this ice machine unique that it also provides you with cold water! When the cubes are ready, push the “Drop ice” button to get them. For cold water, press the water button. Thus, it can be set on tables or bars since the ice or water is served directly from the ice maker. The stainless steel material makes it easier for the device to fit in anywhere. As mentioned above, the freezer can provide you with ice but not always with the best quality and right amount. It takes indeed 30 minutes for it to make 10-20 ice cubes. That won’t definitely be enough to handle a party! You can still go to the store, but you’d miss out then. The solution is to get an ice generator. It’s a very simple but well thought device. Despite being of a small size, they can make about 0,56 lbs of ice within 10 minutes! Design, compact and fast, it’s really useful for outdoor parties during summer. A portable ice maker comes also in handy when you go fishing or camping. It keeps your food and drinks fresh and could be a live saver in case of an accident. The making of ice is an easily understandable process: you fill a tray with clean water and let it freeze. But how exactly does an ice machine deliver a large amount of ice that fast? It’s thanks to the electric motor – divided into a cooling unit, a heating one and an ice tray, that quicken the solidification process. After you’ve filled the ice generator’s water tank, pick the size and the shape of your ice – if the option is available. The cooling unit will start freezing the water. Then it will be heated by the heating unit at its base. The ice will therefore fall into the tray, ready to be collected. All this process’s duration might change with every device, but it never takes over 10 minutes to get the first share of ice. Bear in mind that the ice machine is for making ice, not storing it. Price and value are definitely at the top of the list of things to consider when purchasing an ice maker. A small device isn’t much expensive. And nowadays, there are good deals of aesthetic ice machine. However, you should and must take your needs into account. A good deal is not always the best one. A professional ice generator might be more expensive. But if you own a café, a restaurant or a bar, it is what you need because you’ll need more ice than a house party host and vice-versa. It doesn’t have to be as big as freezer but big enough to deliver a greater quantity. Moreover, you also need to pay attention to the shapes and size the ice delivered by the device. That might sound silly but more than a pretty drink cooler, some shapes do not melt easily and let you enjoy the taste of your cocktail with every sip! Finding the right machine that match your need is then the most important. There is certainly an affordable and design one out there for you. Plus, you can choose a credit purchase and then thank out a loan to buy your ice maker. Whether it’s for food conservation or fresh drinks, the ice machine provides ice for human consumption. It is therefore important to maintain your device on a regular basis. As a matter of fact, the cold is refreshing but it’s also the best environment for microbes and bacteria to grow. When cleaning the ice maker, you have then to be thorough. The frequency of maintenance depends on the use of the appliance. It’s recommended to clean it once every week if the ice machine is actively operating. Now how to proceed? First things first, unplug the device and take off every removable part. Let the frost melt before scraping off the remainder gently. Do not forget to rinse the water tank out. Now that the water and ice have all been cleaned, sponge the pieces with white vinegar. It will scrub the dirt and decontaminate. Put the machine back afterwards and you can use it again. Fresh drinks all along summer! How to make the best of your ice machine?